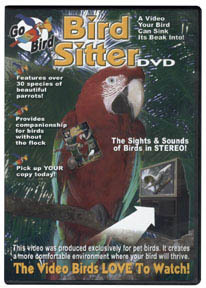 The Bird Sitter is a best selling video produced exclusively for pet birds to watch. The goal in producing The Bird Sitter video is to create entertainment that gives your pets the opportunity to experience life the way they were meant to. This DVD exposes your bird to the sights and sounds of hundreds of parrots enjoying everyday life in a wild flock ... providing mental stimulus leading to a happier and healthier bird.